3D printers come in a surprising variety of shapes and models, and this extends to the print beds as well. I’ve seen round beds, for printers that have a radial print size. 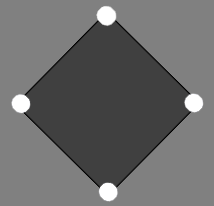 I’ve seen triangle beds, which are supposedly easier to level, because three points determines a plane. I’ve even seen printers without any bed at all, that work by extruding resin from a tank. By far the most common kind of printer bed I’ve seen is square, and it almost always has for posts for level adjustment, with one post at each corner. This can actually make for tricky leveling where adjustments have unintuitive consequences. As was said, it’s three points that define a plane, not four. Using four posts can put strain on a bed and cause warping. I’ve even heard of people removing an entire post, and even re-mounting the third post, in order to get better levels. 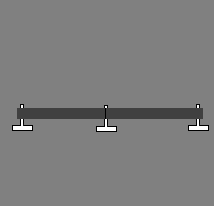 The two knobs in the center can act as the fulcrum of a lever or seesaw, where raising or lowering the bed at one end can have the opposite result on the far end. We can now think of the printer bed acting more like a seesaw or lever, where the two knobs in the center act as the fulcrum. 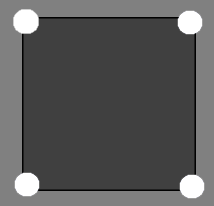 It’s important to understand that a knob does not set a fixed position for that corner. Each corner is secured with a spring that increases or decreases the amount of pressure on the bed at that location relative to the fulcrum created by the two adjacent knobs. Tightening a knob to lower the bed in one corner can also have the effect of raising the bed slightly at the far corner opposite the fulcrum, because now there is more lift pressure against that spring. Because we are dealing with springs, rather than a free-moving lever, this effect is not absolute, but it does happen. Hopefully this helps explain why you sometimes need more than one time around the bed at each corner to get a good level. And perhaps it will help you make smarter adjustments when leveling your print bed in the future.